In order to cater the variegated demands of our precious clients, we are offering an excellent quality range of Barbed Wire Machine. Different sizes and designs are easily available in the market. 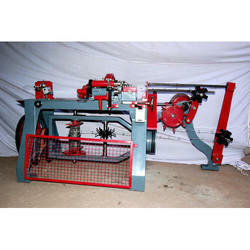 Our range of wire nails making machine are available at most reasonable rates. 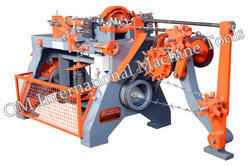 We are offering our customers an excellent quality range of wire nails making machines. these wire nails making machine are made from very high quality raw material which ensures high durability at its user end. The group of barbed wire with unidirectional twist require take up unit of rotary type and this is placed below the table of the barbing unit and mounted on the stands on which the Prem barbing unit stands. The necessary transmission of power off the barbing unit is also incorporated. Production Capacity: 500 Kg. / 8 Hrs. shift for 12 SWG wire with 140 to 160 barbs / min. Barb spacing: Standard 3" & 4" pitch On request, we can prepare the machine to have barb spacing of 5", 6", etc. Machine Weight: 1100 / 1400 Kg. Barb spacing: 3", 5", 4", >5"
Fully automatic barbed wire making machines (heavy duty) with all standard accessories and adjustment parts. Wire used - both galvanized and pvc cotted. Barbed distance can also be adjustable.